Medline's cost-effective fashion canes act as mobility aids and fashion accessories. 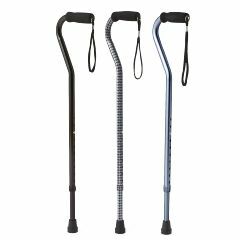 Colorful designs and unique patterns provide users the right cane for different occasions. Let customers get away from the institutional look of chrome walking aids. Foam handles and convenient wrist straps. Height adjustment, 29-38" (74-96.5 cm); Cane weight, 0.8 lbs. (0.4 kg). AllegroMedical.com presents The Offset Handle Fashion Canes. Medline's cost-effective fashion canes act as mobility aids and fashion accessories. Colorful designs and unique patterns provide users the right cane for different occasions. Let customers get away from the institutional look of chrome walking aids. Foam handles and convenient wrist straps. Height adjustment, 29-38" (74-96.5 cm); Cane weight, 0.8 lbs. (0.4 kg).